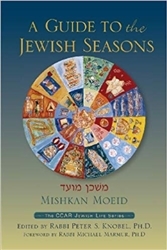 Mishkan Moeid: Guide to the Jewish Seasons offers a survey of the sacred days of the Jewish yearly cycle. Based on CCAR's classic Gates of the Seasons, this volume is revised and updated for a new generation. Within is detailed guidance on Shabbat and the Jewish holidays, including historical background and extensive notes. Also included are new essays from leading rabbis, such as "What is a Mitzvah," "Technology and Sacred Time," by Rabbi Lisa J. Grushcow, D.Phil., "Holiness, Mitzvot, and Justice in Jewish Time," by Rabbi Jonah Pesner, "Approaching the High Holy Days," by Rabbi Elaine Zecher, "The Festival and Holy Day Liturgy of Mishkan T'filah," by Rabbi Joel Sisenwine, "Eating Our Values," by Rabbi Mary L. Zamore, "The People of the Food," by Tina Wasserman, "M'nuchah and M'lachah: On Observing the Sabbath in Reform Judaism," by Rabbi Mark Washofsky, Ph.D., and "The Journey to Judaism: Choosing Judaism, Choosing Mitzvot," by Rabbi Judith Schindler.